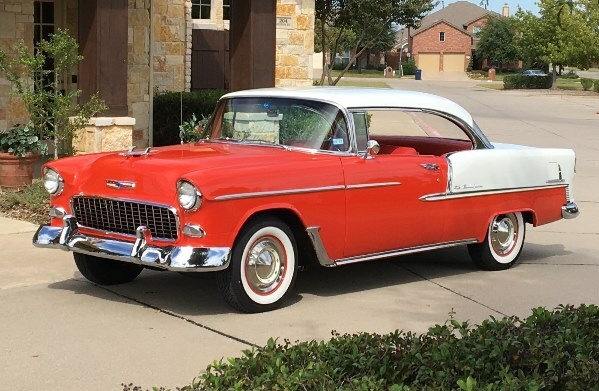 As with many Tri-Five owners, this story started fifty-five years ago with my first car…a nice 1955 Bel Air convertible that I purchased in 1963 for $350. A lot of money in the day, especially for a junior in high school. I spent all my extra cash upgrading the car to my liking. After all, it needed some work. First was a new paint job; I wanted my car to stand out with fresh candy apple red paint and a new white convertible top. And, of course, a new interior which was white rolled and pleated vinyl. Then I focused my attention on the mechanics. First came the engine. I upgraded the 2 bbl. 265 to a junkyard find; a 283 powerpack 4bbl. Then I switched out the manual 3-speed for a four speed and a 4:11 rear end. Nothing better than cruising Austin in a beautiful ‘55 Chevy convertible with all my friends, and able to hold its own if I was challenged. At least from stop light to stop light! Then came college, girls and other priorities, so I sold the ‘55 and moved on to a beautiful white with red/black hounds-tooth interior ‘60 Impala with a 348! Then life, career, family and things… just happened. Fast forward to 2016. As I was thinking about retirement, and, looking for a hobby to keep me busy…it hit me like a “ton of bricks”. You need to find a restored ‘55 Chevy that you can tinker with. One that is in great shape but still needing some special TLC. That’s when I found my current ‘55. A driver with great body, paint, interior and mechanicals. Her name... “Peggy Sue”. Her history is pretty straight forward. She was born as a red/white 6 cyl. automatic beauty, delivered to an Iowa dealer and sold to a family in Wisconsin, where she spent most of her life. Later, at some point, she was purchased by a Cincinnati, Ohio car enthusiast who performed a terrific partial restoration; body, paint, interior, carpet, new SBC engine, four-speed, and more completed in 2007. This restomod was later purchased by a Pennsylvania car collector whom I bought her from in 2016. After looking all over, both locally and online, and making several offers for similar cars that didn’t work out, I finally made the purchase and had her shipped to Texas. She was exactly as expected; great body, paint and interior, good mechanics and smooth ride. But I just couldn’t leave things alone. After all, I wanted to tinker. My goal was to make this ‘55 look original, but improve the ride, and performance and safety…something I would be comfortable driving whenever and wherever I want. First priority…rewire and convert to digital gauges. Once I saw that a prior owner (probably the restorer) had tapped the original seven-circuit fuse box with an additional seven or eight piggy-backs on an overloaded fuse box with original glass fuses, I knew my first move was to rewire the car, with new circuit breakers, and upgrade the gauges to digital. So, American Autowire and Dakota Digital gauges to the rescue. Voila! Then came the wheels and tires. For some reason, the restorer added 14” wheels, with lancer style wheel covers and WW tires. Since my game plan was to visually bring the ‘55 up to original standards, visually…the 14” wheels, lancers, etc. had to go. I immediately replaced them with 15” wheels and OEM style wheel covers and new WW tires. Now she looks like she’s supposed to! All dressed up and ready to dance! From a distance, she looks like an original ‘55 Chevy Bel Air two door hardtop. But lift the hood and you see a different story. A chromed SBC with all the goodies, including Vintage A/C, variable speed electric fan, front power disc brakes, Hedman headers, electronic ignition, aluminum radiator, and much more. Next, I wanted to improve the stance and suspension. So, I replaced the original front end, lowered springs, sway bar, and steering with all new parts, lowering the front-end stance 1.5”. Wicked! The next item on the project list was to improve the highway performance. The four-speed was nice but had to go. So, I installed a new Tremec 5-speed with overdrive. A huge improvement in performance and highway gas mileage. And I upgraded to power steering. Route 66, here we come! But the biggest improvement came with the engine. You see, I was told several stories about what the engine was; 350 crate, ZZ4, Vortec, 30-over, etc. So, I spent quite a bit of time running down block and head numbers, to really find that I had a respectable 1987 to 1995 truck engine. I decided to upgrade this SBC by rebuilding it by adding new higher compression free-flowing vortec aluminum heads, high rise intake, flat-top pistons, roller cam, lifters, rockers, big carb, etc. So, I did and now have an SBC that really gets down the road, after dyno-tune. And looks great too! Oh, and of course, I needed to tinker with the tunes…new speakers and slide-bar digital radio with Bluetooth, iPod, USB and Sirius/XM satellite radio. Happy Times! Next big project; upgrade to either a 9” Ford or 12 bolt Chevy rear end and new rear suspension. Maybe next year. This all sounds like more than tinkering, I know. But, with all 63-year-old classic cars…there’s always something else to do. After all, I’m retired with plenty of time and never satisfied. My wife and I have bought her out too many gatherings and shows over the last couple of years. We hope to expand our “territory” a bit each year and look forward to meeting more DACC members along our journey.